Alfred Leete's recruitment poster for Kitchener's Army. The New Army, often referred to as Kitchener's Army or, disparagingly, as Kitchener's Mob,[a] was an (initially) all-volunteer army of the British Army formed in the United Kingdom from 1914 onwards following the outbreak of hostilities in the First World War in late July 1914. 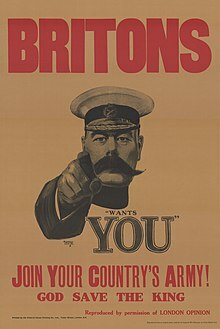 It originated on the recommendation of Herbert Kitchener, then the Secretary of State for War to raise 500,000 volunteers. Kitchener's original intention was that it would be formed and ready to be put into action in mid-1916, but circumstances dictated its use before then. The first use in a major action came at the Battle of Loos (September–October 1915). Contrary to the popular belief that the war would be over by Christmas 1914, Kitchener predicted a long and brutal war. He believed that arrival in Europe of an overwhelming force of new, well-trained and well-led divisions would prove a decisive blow against the Central Powers. Kitchener fought off opposition to his plan, and attempts to weaken or water down its potential, including piece-meal dispersal of the New Army battalions into existing regular or Territorial Force divisions (the view of the Commander-in-Chief of the BEF (British Expeditionary Force), Field Marshal French). 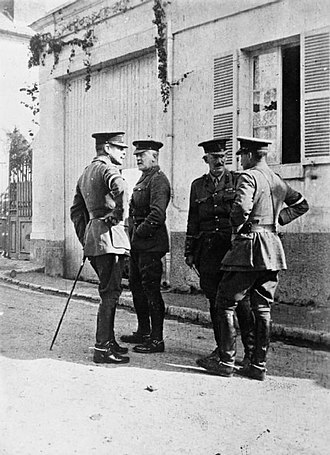 Kitchener declined to use the existing Territorial Force (set up by Lord Haldane and Douglas Haig as part of the Army reforms of the Edwardian period) as the basis for the New Army, as many of its members had volunteered for "Home Service" only, and because he was suspicious of the poor performance of French "territorials" in the Franco-Prussian War 1870–1871. In the early days of the war, the Territorial Force could not reinforce the regular army, as it lacked modern equipment, particularly artillery. 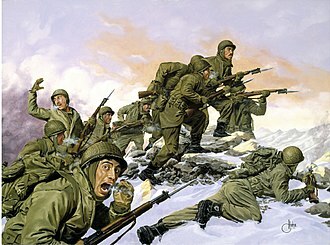 In addition, it took time to form First-Line units composed only of men who had volunteered for "General Service". Those recruited into the New Army were used to form complete battalions under existing British Army Regiments. These new battalions had titles of the form "xxth (Service) Battalion, <regiment name>". The first New Army divisions were used at the Battle of Loos in the autumn of 1915, and they were sorely tested in the Battle of the Somme. The initial BEF—a single army of five regular divisions in August 1914, two armies comprising 16 divisions by the end of the 1914 when the Territorials had been deployed—had grown to five armies totalling around 60 divisions in strength by the summer of 1916, approximately 2 million men, of whom around half were infantry (the rest were gun crews, supply and logistics men etc.). All five of the full army groups (meaning a group of divisions similar in size to an army, not a group of armies) were made up of volunteer recruits, which included the famous Pals' Battalions. Due to the huge numbers of men wishing to sign up, in places queues up to a mile long formed outside recruitment offices. There were many problems in equipping and providing shelter for the new recruits. Rapidly the Government added many new recruitment centres, which eased the admissions burden, and began a programme of temporary construction at the main training camps. 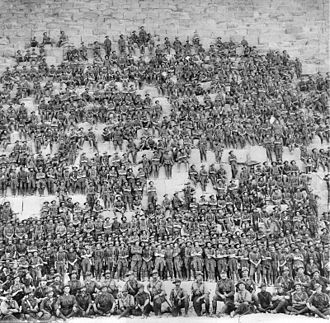 Almost 2.5 million men volunteered for Kitchener's Army. The first conscripts arrived in France in late 1916 to fill the gaps in the volunteer units, which had been greatly diminished during the Battle of the Somme. 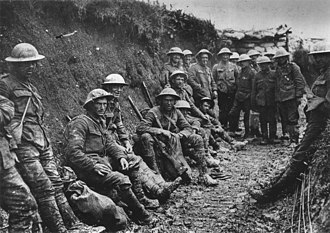 After the bloody battles of 1916 and 1917, the British army facing the Ludendorff Offensive of 1918 were mainly conscripted youths, most of them under 20 years of age, although there were also some men in their late thirties or older. Roughly half of those who served in the British Army throughout the war, including more than half of the five million men serving in the British Army in 1918, were conscripts. The British army traditionally recruited on a regimental basis, therefore a recruit accepted into the army was first sent to his new regimental depot, where he received his kit[b] and was introduced to army discipline and training. Next he was sent to the main training camps to join his battalion. In practice, no regiment had the required stocks of equipment, or the manpower to train the flood of recruits; men trained wearing their own clothes and shoes. To mitigate this problem, the army issued old stored uniforms, including First Boer War–vintage red jackets. Some regiments bought their own uniform and boots with money paid from public collections. Many regiments were also issued with emergency blue uniforms, popularly known as Kitchener Blue. Whilst this crisis went on, the soldiers wore regimental and unit badges or patches on their clothing. Many photographs from the era show uniformed soldiers drilling alongside civilian clothed soldiers, perhaps led by red-jacketed NCOs. The Regiments also suffered from a lack of officers to train them. The government called up all reserve-list officers and any British Indian Army officer who happened to be on leave in the UK during the period. Men who had been to a recognised public school and university graduates, many of whom had some prior military training in Officer Training Corps, were often granted direct commissions. Commanding officers were encouraged to promote promising leaders and later in the war it was common for officers ("temporary gentlemen") to have been promoted from the ranks to meet the demand, especially as casualty rates among junior infantry officers were extremely high. Many officers, both regular and temporary, were promoted to ranks and responsibilities far greater than they had ever realistically expected to hold. The Army had difficulty supplying new units with enough weapons. 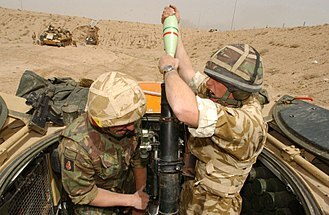 No artillery pieces had been left in Britain to train new artillery brigades, and most battalions had to drill with obsolete rifles or wooden mockups. By early 1915 the Government had overcome many of these problems. Among its methods was pressing into use old ceremonial cannons and unfinished modern artillery pieces (they lacked targeting sights). During 1915, it corrected such shortages. At the beginning of 1918, the shortage of manpower in the British Expeditionary Force in France became acute. The Army ordered infantry divisions to be reduced from twelve infantry battalions to nine. The higher-numbered battalions (in effect the New Army units, and some Second-Line Territorial units) were to be disbanded rather than the lower-numbered Regular and First-Line Territorial battalions. (Since Kitchener's death in 1916, no other major figure opposed this fundamental change to the principles on which the New Army had been raised.) In some cases, New Army divisions had to disband about half of their units to make room for surplus battalions transferred from Regular or First-Line Territorial divisions. While the change reduced the unique sense of identity of some New Army formations, it developed the divisions in France into more homogeneous units. By this time there was no longer much real distinction between Regular, Territorial, and New Army divisions. 14th (Light) Division—originally 8th (Light) Division but renumbered when the regular army 8th Division was formed in September 1914. The divisions were not fully formed when the decision was made to use them to provide replacements for the first three New Armies. The divisions were broken up on 10 April 1915; the infantry brigades and battalions became reserve formations and the other divisional troops were transferred to the divisions of the newly created Fourth and Fifth New Armies. Redesignated K4 following breakup of original K4. Following the re-designation of the previous K5 Army Group, a new K5 Army Group was formed. 36th (Ulster) Division—raised as the Ulster Division, numbered on 28 August 1914. 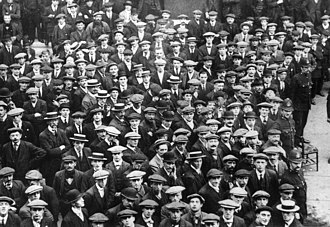 ^ "'Kitchener's Mob' they were called in the early days of August, 1914, when London hoardings were clamorous with the first calls for volunteers. The seasoned regulars of the first British expeditionary force said it patronizingly, the great British public hopefully, the world at large doubtfully. 'Kitchener's Mob,' when there was but a scant sixty thousand under arms with millions yet to come. 'Kitchener's Mob' it remains to-day, fighting in hundreds of thousands in France, Belgium, Africa, the Balkans. And to-morrow, when the war is ended, who will come marching home again, old campaigners, war-worn remnants of once mighty armies? 'Kitchener's Mob.'" ^ W.N. Medlicott, Contemporary England 1914-1964 (1967) p. 21. ^ Charles E. Carrington, "Kitchener's Army: The Somme and After." The RUSI Journal 123#1 (1978): 15-20. ^ Baker, Chris. "The 14th (Light) Division in 1914–1918". The Long, Long Trail. Retrieved 17 January 2014. ^ Baker, Chris. "The 30th Division in 1914–1918". The Long, Long Trail. Retrieved 17 January 2014. ^ Baker, Chris. "The 31st Division in 1914–1918". The Long, Long Trail. Retrieved 17 January 2014. ^ Baker, Chris. "The 32nd Division in 1914–1918". The Long, Long Trail. Retrieved 17 January 2014. ^ Baker, Chris. "The 33rd Division in 1914–1918". The Long, Long Trail. Retrieved 17 January 2014. ^ Baker, Chris. "The 34th Division in 1914–1918". The Long, Long Trail. Retrieved 17 January 2014. ^ Baker, Chris. "The 35th Division in 1914–1918". The Long, Long Trail. Archived from the original on 21 December 2011. Retrieved 17 January 2014. ^ Baker, Chris. "The 36th (Ulster) Division in 1914–1918". The Long, Long Trail. Retrieved 17 January 2014. ^ Baker, Chris. "The 37th Division in 1914–1918". The Long, Long Trail. Retrieved 17 January 2014. ^ Baker, Chris. "The 38th (Welsh) Division in 1914–1918". The Long, Long Trail. Retrieved 17 January 2014. Becke, Major A.F. (1938). Order of Battle of Divisions Part 3A. New Army Divisions (9–26). London: His Majesty's Stationery Office. ISBN 1-871167-08-6. Becke, Major A.F. (1945). Order of Battle of Divisions Part 3B. New Army Divisions (30–41) & 63rd (RN) Division. London: His Majesty's Stationery Office. ISBN 1-871167-08-6. Carrington, Charles E. "Kitchener's Army: The Somme and After." The RUSI Journal 123#1 (1978): 15-20. Ginzburg, Carlo. "‘Your Country Needs You’: A Case Study in Political Iconography." History Workshop Journal . No. 52. 2001. Royle, Trevor. Kitchener Enigma: The Life and Death of Lord Kitchener of Khartoum, 1850-1916 (The History Press, 2016). The 13th Division was one of the Kitcheners Army divisions in the First World War, raised from volunteers by Lord Kitchener. It fought at Gallipoli, in Mesopotamia, and Persia, the 13th Division was formed as part of the First New Army at Salisbury Plain in August 1914. During the formation of the division, Major-General Robert Kekewich was appointed as its first commander, however, on 5 November 1914, he committed suicide. The 13th Division landed at Anzac on the Gallipoli peninsula in July 1915 in preparation for the August Offensive that was launched on 6 August, although all of its component infantry battalions arrived, the Divisions artillery did not arrive for some months. Initially in reserve to the breakout from Anzac by units of the New Zealand and Australian Division. When the Turks counter-attacked on the morning of 10 August the divisions troops on Chunuk Bair and at The Farm, about 3000 men, were decimated. By September 1915, the 13th Division as a whole had suffered nearly 6,000 killed, wounded, of the thirteen battalion commanders, ten had become casualties. During September, Major-General Sir Stanley Maude had been assigned to take over the shattered 13th Division, at the beginning of October the Division was moved from Anzac to Suvla Bay. Even though the Division was once again in reserve, it was taking daily casualties from the Turkish Artillery. However, by time the high command already realized that the Dardanelles Campaign was a lost cause. To Maude fell the task of making sure that the 13th Division slipped away in the night during the evacuation of the Suvla Bay positions, the methodical commander, recorded, I do not think we left behind us £200 worth of stuff worth having. I got away all my guns and ammunition and we even destroyed the sandbags which we had to leave in the parapets by ripping them with bayonets or clasp knives to make them useless. 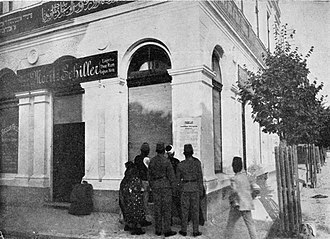 The withdrawal was apparently a surprise for the Turks, for nothing happened on either night beyond the usual sniping and firing. 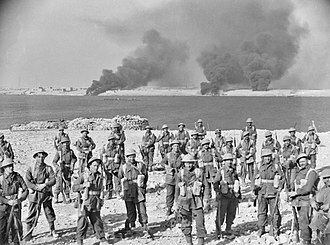 After being evacuated from Suvla, the 13th Division was ordered to reinforce the British forces at Cape Helles, however, no sooner than the division had arrived through W Beach, than the decision to evacuate this last foothold. A regiment is a military unit. 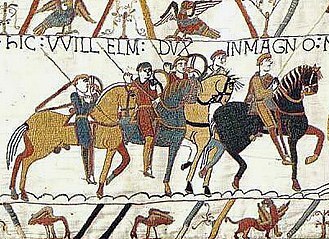 Their role and size varies markedly, depending on the country, in Medieval Europe, the term regiment denoted any large body of front-line soldiers, recruited or conscripted in one geographical area, by a leader who was often the feudal lord of the soldiers. By the 17th century, a regiment was usually about a thousand personnel. In many armies, the first role has been assumed by independent battalions, task forces and other, similarly-sized operational units. By the beginning of the 18th century, regiments in most European continental armies had evolved into permanent units with distinctive titles and uniforms, when at full strength, an infantry regiment normally comprised two field battalions of about 800 men each or 8–10 companies. 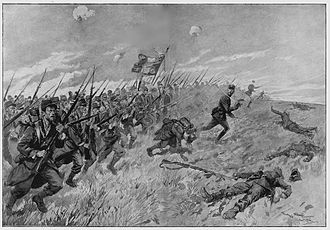 In some armies, an independent regiment with fewer companies was labelled a demi-regiment, a cavalry regiment numbered 600 to 900 troopers, making up a single entity. With the widespread adoption of conscription in European armies during the nineteenth century, the regimental system underwent modification. Prior to World War I, a regiment in the French, Russian. As far as possible, the battalions would be garrisoned in the same military district, so that the regiment could be mobilized. A cavalry regiment by contrast made up an entity of up to 1,000 troopers. Usually, the regiment is responsible for recruiting and administering all of a military career. Depending upon the country, regiments can be either combat units or administrative units or both and this is often contrasted to the continental system adopted by many armies. 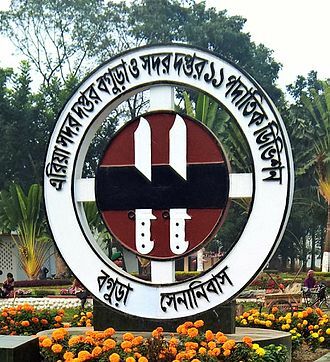 Generally, divisions are garrisoned together and share the same installations, thus, in divisional administration and officers are transferred in and out of divisions as required. Some regiments recruited from specific areas, and usually incorporated the place name into the regimental name. In other cases, regiments would recruit from an age group within a nation. In other cases, new regiments were raised for new functions within an army, e. g. the Fusiliers, the Parachute Regiment, a key aspect of the regimental system is that the regiment or battalion is the fundamental tactical building block. The Indian Army was the principal army of India before independence from the United Kingdom in 1947. It was responsible for the defence of both British India and the Princely states, which could have their own armies. The Indian Army was an important part of the British Empires forces, the term Indian Army appears to have been first used informally, as a collective description of the Presidency armies of the Presidencies of British India, particularly after the Indian Rebellion. The first army officially called the Indian Army was raised by the government of India in 1895, however, in 1903 the Indian Army absorbed these three armies. The Indian Army should not be confused with the Army of India which was the Indian Army itself plus the British Army in India, before 1858, the precursor units of the Indian Army were units controlled by the Company and were paid for by their profits. These operated alongside units of the British Army, funded by the British government in London. Many of these took part in the Indian Mutiny, with the aim of reinstating the Mughal Emperor Bahadur Shah II at Delhi. The meaning of the term Indian Army has changed over time, The officer commanding the Army of India was the Commander-in-Chief, the title was used before the creation of a unified British Indian Army, the first holder was Major General Stringer Lawrence in 1748. By the early 1900s the Commander-in-Chief and his staff were based at GHQ India, Indian Army postings were less prestigious than British Army positions, but the pay was significantly greater so that officers could live on their salaries instead of having to have a private income. Accordingly, vacancies in the Indian Army were much sought after and generally reserved for the higher placed officer-cadets graduating from the Royal Military College, Sandhurst. British officers in the Indian Army were expected to learn to speak the Indian languages of their men, prominent British Indian Army officers included Frederick Roberts, 1st Earl Roberts, William Birdwood, 1st Baron Birdwood, Claude Auchinleck and William Slim, 1st Viscount Slim. Commissioned officers and Indian, held identical ranks to commissioned officers of the British Army, Kings Commissioned Indian Officers, created from the 1920s, held equal powers to British officers. Viceroys Commissioned Officers were Indians holding officer ranks and they were treated in almost all respects as commissioned officers, but had authority over Indian troops only, and were subordinate to all British Kings Commissioned Officers and KCIOs. They included Subedar Major or Risaldar-Major, equivalents to a British Major, Subedar or Risaldar equivalents to Captain, recruitment was entirely voluntary, about 1.75 million men served in the First World War, many on the Western Front and 2.5 million in the Second. Soldier ranks included Sepoys or Sowars, equivalent to a British private, British Army ranks such as gunner and sapper were used by other corps. In the aftermath of the Indian Mutiny of 1857, known as the Sepoy Mutiny. The three Presidency armies remained separate forces, each with its own Commander-in-Chief, overall operational control was exercised by the Commander-in-Chief of the Bengal Army, who was formally the Commander-in-Chief of the East Indies. Field Marshal Douglas Haig, 1st Earl Haig, KT, GCB, OM, GCVO, KCIE, ADC was a senior officer of the British Army. During the First World War he commanded the British Expeditionary Force on the Western Front from late 1915 until the end of the war and he was nicknamed Butcher Haig for the two million British casualties endured under his command. The Canadian War Museum comments, His epic but costly offensives at the Somme and Passchendaele have become synonymous with the carnage. Haig was born in a house on Charlotte Square, Edinburgh but technically it was addressed as 19 Hope Street and he was not an aristocrat by birth, or landed gentry. His father John Haig—an irascible alcoholic—was middle class, and as head of the familys successful Haig & Haig whisky distillery had an income of £10,000 per year and his mother was from a gentry family fallen on straitened circumstances. Rachels cousin, Violet Veitch, was mother of the playwright, Haigs education began in 1869 as a boarder at Mr Batesons School in Clifton Bank, St Andrews. Later in 1869, he switched to Edinburgh Collegiate School, and in 1871 to Orwell House, both of Haigs parents died by the time he was eighteen. After a tour of the United States with his brother, Haig attended university, studying Political Economy, Ancient History and French Literature at Brasenose College, Oxford and he devoted much of his time to socialising – he was a member of the Bullingdon Club – and equestrian sports. He was one of the best young horsemen at Oxford and quickly found his way into the University polo team and he was commissioned as a lieutenant into the 7th Hussars on 7 February 1885. Haig played polo for England on a tour of the United States and he would remain a polo enthusiast all his life, serving as Chairman of the Hurlingham Polo Committee from its reorganization in May 1914 until 1922. He would be President of the Army Polo Committee and founder of the Indian Polo Association and he saw overseas service in India, where he was appointed the regiments adjutant in 1888. The 20th Division was an infantry division of the British Army, part of Kitcheners Army, raised in the First World War. The division was formed in September 1914 as part of the K2 Army Group, the division landed in France July 1915 and spent the duration of the First World War in action on the Western Front. 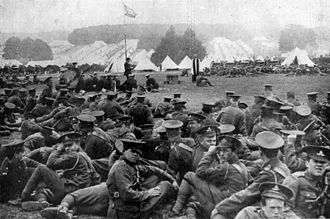 The 20th Division was authorised on 11 September 1914 and was to be composed of newly raised battalions from quick marching rifle, the 59th and 60th Brigades were concentrated at Blackdown with the Division Headquarters and other division troops. The 61st Brigade was concentrated at Aldershot, where the medical component trained, the Artillery was formed near Deepcut, in April the Division marched to Salisbury Plain to complete its training and were joined by the field ambulances after their training in June. The Division was inspected by the King at the end of that month, leaving Amesbury on 20 July, by 26 July the Division was concentrated in the Lumbres area 22 miles east of Boulogne-sur-Mer. 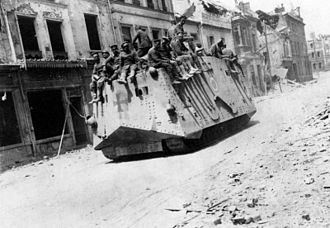 By 30 July the Division was part of III Corps of the First Army, and was billeted in the area between Hazebrouck and Armentières. Training now began in trench warfare, with officers and N. C. O. s being posted to the 8th and 27th Divisions, and bombing, machine gun and gas mask training for the other troops. 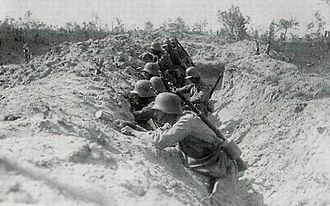 The units of the Division were rotated though the 8th and 27th Divisions in turn to experience trench warfare first hand between 2 and 17 August, the engineers and pioneers were employed at various tasks behind the lines. At the end of August the Division went into the front line in front of Levantie,5 miles south west of Armentiers, 59th and 60th Brigades in the line, in this area the high water table meant that breastworks were required for defence. During September mining and counter mining were carried out and snipers were trained in response to losses from German snipers, the 61st Brigade moved into the line on 5 September, relieving a brigade of the 8th Division. In the early hours of 13 September a mine was exploded by the Germans under a small salient held by 7th S. L. I. The crater was occupied by others from the battalion in spite of German shelling and mortaring, the division history records the first gallantry awards earned by men of the Division during this action, a Military Cross and a Distinguished Service Medal. As part of a subsidiary action north of Loos, the 20th Division with the flanking Divisions were to launch an attack on the German lines. The other two brigades made no advance that day but were still shelled in their trenches. Lieutenant George Allen Maling R. A. M. C. of the field attached to the 60th Brigade won the Victoria Cross for treating men in the open under heavy shell fire all through the day. 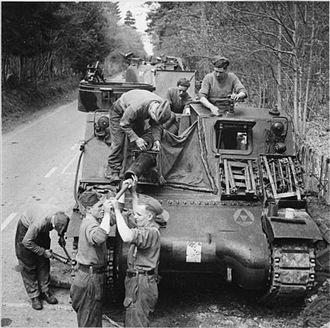 The three brigades remained in the line, engaged in patrolling, mortaring and demonstrating in order to prevent the Germans relieving parts of their line, the Divisions mounted troops rotated through the trenches, and the cyclist company troops provided working parties. For the rest of the year the Divisions artillery saw the most use, however a trench raid by parties from 10th R. B. and 11th K. R. R. C.
The Central Powers, consisting of Germany, Austria-Hungary, the Ottoman Empire and Bulgaria – hence known as the Quadruple Alliance – was one of the two main factions during World War I. It faced and was defeated by the Allied Powers that had formed around the Triple Entente, the Powers origin was the alliance of Germany and Austria-Hungary in 1879. The Ottoman Empire and Bulgaria did not join until after World War I had begun, the Central Powers consisted of the German Empire and the Austro-Hungarian Empire at the beginning of the war. The Ottoman Empire joined the Central Powers in 1914, in 1915, the Kingdom of Bulgaria joined the alliance. The name Central Powers is derived from the location of these countries, finland and Lithuania joined them in 1918 before the war ended and after the Russian Empire collapsed. When Russia enacted a general mobilization, Germany viewed the act as provocative, the Russian government promised Germany that its general mobilization did not mean preparation for war with Germany but was a reaction to the events between Austria-Hungary and Serbia. The German government regarded the Russian promise of no war with Germany to be nonsense in light of its general mobilization, and Germany, in turn, mobilized for war. On August 1, Germany sent an ultimatum to Russia stating that since both Germany and Russia were in a state of military mobilization, a state of war existed between the two countries. 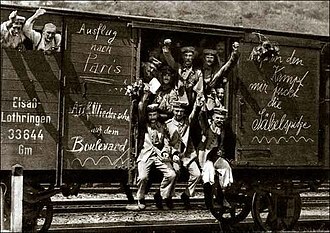 After Germany declared war on Russia, France with its alliance with Russia prepared a general mobilization in expectation of war, on 3 August 1914, Germany responded to this action by declaring war on France. This plan was hoped to gain victory against the French. Belgium was a country and would not accept German forces crossing its territory. Germany disregarded Belgian neutrality and invaded the country to launch an offensive towards Paris, europe Upon its founding in 1871, the German Empire controlled Alsace-Lorraine as an imperial territory incorporated from France after the Franco-Prussian War. It was held as part of Germanys sovereign territory, Africa Germany held multiple African colonies at the time of World War I. The 16th Division was an infantry division of the British Army, raised for service during World War I. The division was a voluntary Service formation of Lord Kitcheners New Armies, created in Ireland from the National Volunteers, initially in September 1914, after the outbreak of the Great War. Moved by the fate of Belgium, a small and Catholic country, John Redmond had called on Irishmen to enlist in defence of the highest principles of religion and morality, more Catholic Irish enlisted than Protestants. Initial training began in Ireland at Fermoy, recruits trained at Buttevant, the division moved to Aldershot in Hampshire, England for more intensive training in September 1915. From there the division left on 18 December for that part of the front in the Loos salient, under the command of Irish Major General William Hickie and spent the rest of the war on the Western Front. Until March 1916 the 16th Division was part of IV Corps, commanded by the staunch unionist, Hickie agreed that he had a political Divn of riff raff Redmondites. Wilson thought the 47th Brigade had old officers, old & useless men, very bad musketry, rotten boots, Hickie was–in public–much more diplomatic and tactful and spoke of the pride which his new command gave him. At Loos, in January and February 1916, the division was introduced to warfare and suffered greatly in the Battle of Hulluch. Personnel raided German trenches all through May and June, in late July they were moved to the Somme Valley where they were intensively engaged in the Battle of the Somme. The 16th Division played an important part in capturing the towns of Guillemont and Ginchy, although they suffered massive casualties. Out of a total of 10,845 men, it had lost 3,491 on the Loos sector between January and the end of May 1916, including heavy casualties from bombardment and a gas attack at Hullach in April. 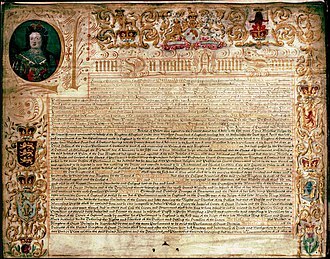 Bloodletting of this order was fatal to the character, for it had to be made good by drafts from England. In early 1917, the took a major part in the Battle of Messines alongside the 36th Division. The 8th Infantry Division was an infantry division of the British Army that was active in both World War I and World War II. It was briefly reformed in Syria in a role during 1942-3. The 8th Division was a Regular Army division that was formed by combining battalions returning from outposts in the British Empire at the outbreak of the First World War, major-General Francis Davies took command on 19 September 1914. The division moved to France in November,1914, following the First Battle of Ypres, in 1939 it was based in Palestine and consisted of two infantry brigades. Due to the needs of defence against German and Italian forces these units were sent to places of need and reformed as different formations, although it had infantry it had no divisional troops due to the shortage of artillery and engineers in the Middle East. Its units were dispersed and the Division was disbanded on 28 February 1940, the Division headquarters was reformed in Syria on 2 June 1942 from the headquarters of the 5th Cavalry Brigade with an administration and internal security role under the Ninth Army. The Battle of Loos was a World War I battle that took place from 25 September –13 October 1915 in France on the Western Front, during the First World War. It was the biggest British attack of 1915, the first time that the British used poison gas, the French and British tried to break through the German defences in Artois and Champagne and restore a war of movement. Despite improved methods, more ammunition and better equipment, the Franco-British attacks were contained by the German armies, British casualties at Loos were about twice as high as German losses. The battle was the British part of the Third Battle of Artois, at the Frévent Conference on 27 July, Field Marshal French failed to persuade Ferdinand Foch that an attack further north offered greater prospects for success. The debate continued into August with Joffre siding with Foch and the commanders being over-ruled by Herbert Kitchener, on 3 May, the British decided upon use of poison gas in military operations in France. French was doubtful that a breakthrough would be achieved, Haig was hampered by the shortage of artillery ammunition, which meant the preliminary bombardment, essential for success in trench warfare, was insufficient. Prior to the British attack, about 140 long tons of gas was released with mixed success. Wanting to be closer to the battle, French had moved to a command post at Lilliers. In many places British artillery had failed to cut the German wire in advance of the attack, advancing over open fields, within range of German machine guns and artillery, British losses were devastating. The British were able to break through the weaker German defences and capture the town of Loos-en-Gohelle and communications problems, combined with the late arrival of reserves, meant that the breakthrough could not be exploited. Haig did not hear until 10,00 a. m. that the divisions were moving up to the front, when the battle resumed the following day, the Germans had recovered and improved their defensive positions. 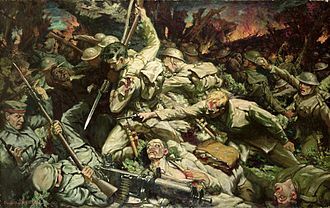 British attempts to continue the advance with the reserves were repulsed, twelve attacking battalions suffered 8,000 casualties out of 10,000 men in four hours. A lull fell on 28 September, with the British having retreated to their positions, having lost over 20,000 casualties. Men of the Wiltshire Regiment attacking near Thiepval, 7 August 1916, during the Battle of the Somme. 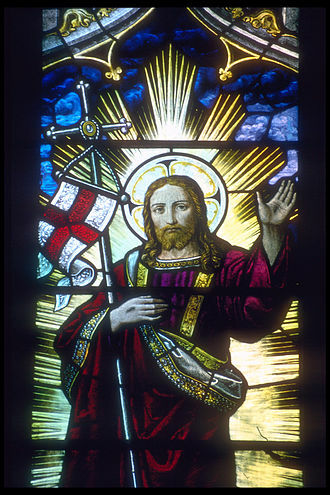 Photo taken by Ernest Brooks. General Officers of World War I, painting by John Singer Sargent (1922). German soldiers in the battlefield in August 1914 on the Western Front shortly after the outbreak of war. 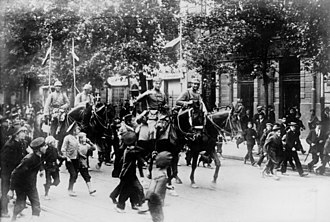 German cavalry entering Warsaw in 1915. 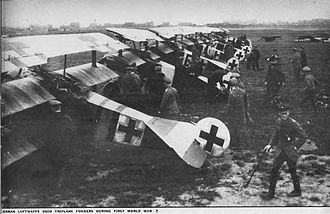 German Fokker Dr.I fighter aircraft of Jasta 26 at Erchin in German-occupied territory of France. Austro-Hungarian soldiers in trench on the Italian front during World War I. The front line in 1916, British gains during the battle of the Somme are shaded blue. Colonel French in full dress uniform, 1892. This is one of the few photographs of French taken before his appearance aged dramatically, and hinting at his success as a womaniser. French in full ceremonial uniform as Aide-de-Camp to King George V in September 1911. Haldane at West Point sometime before the Great War. British aerial photograph of German trenches north of Thiepval, 10 May 1916, with the German forward lines to the lower left. The crenellated appearance of the trenches is due to the presence of traverses. British troops moving up to the attack during the Battle of Morval, 25 September 1916. 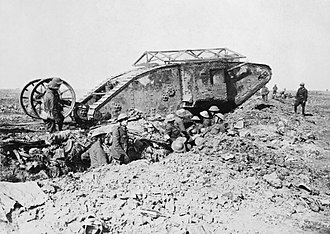 British Mark I male tank near Thiepval, 25 September 1916. 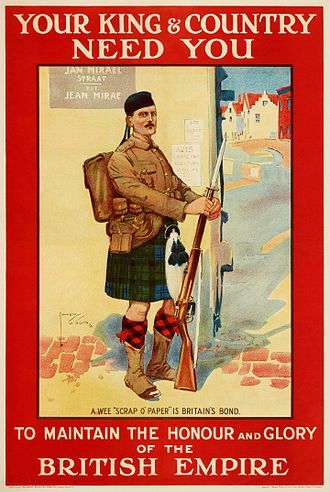 A 1914 recruitment poster shows a Scottish soldier in Belgium, in response to Germany describing the Treaty of London, which protected Belgium's independence and neutrality, as a "scrap of paper" when they invaded in August 1914. Comparative numbers of German and Allied front-line infantry from April to November 1918. French and British troops marching back through Passy-sur-Marne, 29 May 1918. Hereford is one of the church's 43 cathedrals; many have histories stretching back centuries. Major repairs were done to Canterbury Cathedral after the Restoration in 1660. A painting showing a sowar of the 6th Madras Light Cavalry, circa 1845. The Queen's Own Madras Sappers and Miners, 1896. No. 4 (Hazara) Mountain Battery with RML7 pounder "Steel Gun" Mountain Gun in Review Order. Left to right Naick, Havildar, Subadar (Sikhs) and Gunner (Punjabi Musalman) circa 1895. 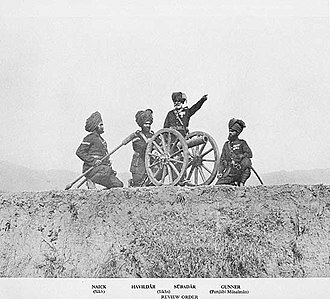 The 5th Royal Gurkha Rifles in Waziristan during the Third Anglo-Afghan War. Outpost manned by men of the 11th (Service) Battalion, Argyll and Sutherland Highlanders on a road beside the Lys Canal near Saint-Floris, 9 May 1918. Men of the 8th Battalion, Royal Scots move forward past a Humber Scout Car of 31st Tank Brigade during Operation Epsom, 28 June 1944. Men of the 10th Battalion, Highland Light Infantry advance during Operation 'Epsom', 26 June 1944. Men of the 7th Battalion, Seaforth Highlanders advance up to the front line, 4 August 1944. Crowd gathered in College Green for the unveiling of a Celtic Cross in memory of the 16th (Irish) Division, Armistice Day, 1924. Men of the 16th (Irish) Division (possibly of the 47th Brigade) in a lorry going back for a rest after taking Guillemont, 3 September 1916. They are passing by the "Minden Post" on the Fricourt-Maricourt road, west-south-west of Carnoy. Note some soldiers wearing captured German pickelhaubes and feldmutzes. Two soldiers clearly display cap badges of the Royal Irish Regiment. 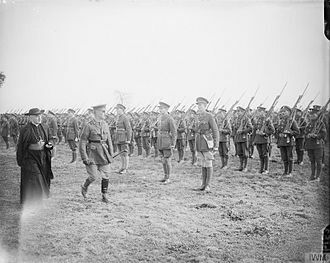 Cardinal Francis Bourne, the Head of the Catholic Church in England and Wales, and Major-General William Hickie, General Officer Commanding (GOC) 16th (Irish) Division, inspecting troops of the 8/9th (Service) Battalion, Royal Dublin Fusiliers at Ervillers, 27 October 1917. Memorial to the 16th Irish Division in Glasnevin Cemetery, 2016. Men of the 11th (Service) Battalion, Durham Light Infantry being taken forward by light railway near Elverdinghe, during the Third Battle of Ypres, 31 July 1917. Oppy under shellfire, May 1917. Formation sign of the 37th Division. Men of the 111th Brigade with trench mortar bombs at Beaumont-Hamel, France, late 1916. 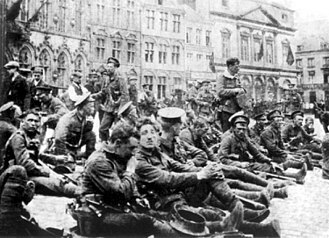 Troops of the 10th (Service) Battalion, Royal Fusiliers halted in Arras, France, before going into action, 9 April 1917. British infantry advancing through gas at Loos, 25 September 1915. View of Gallipoli from the battleship HMS Cornwallis. The smoke is coming from the British and Commonwealth stores being burned during the evacuation. British troops, possibly from the 13th Division, on the march in Mesopotamia. In February 1916, the division was sent to Mesopotamia (modern day Iraq) to reinforce the Tigris Corps. This picture, possibly taken in 1917 because of the prevalence of steel helmets, show British soldiers on the march in Mesopotamia. Infantrymen of the Royal Irish Rifles, 25th Brigade during the Battle of the Somme, 1916. Invitation to one of the regular "smoking" evenings at the London Sketch Club, dated at 11 November 1921. Designed by Alfred Leete.